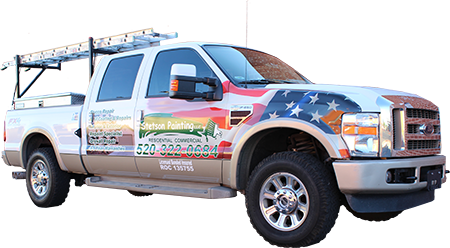 Stetson Painting of Tucson, Sierra Vista and Phoenix boasts 27 + years specializing in residential interior and exterior, multi-family, and commercial new construction repaints as well as all phases of drywall and stucco repair. Our list of expertise includes interior and exterior painting, roof repair, roof coating, pressure washing, specialty coatings, faux painting, water-proofing, stain/lacquer, acoustic repair and removal. Stetson Painting is a locally owned and operated fully licensed, bonded and insured painting contractor. Our mission is to exceed your expectations and satisfaction. Our goal is to provide high quality, professional service on the most competitive level by combining top quality products with highly skilled employees to exceed your expectations. The key to our success has been retaining quality-conscientious, professional painters who accommodate all your needs. Our staff of approximately eight (8) professionally experienced painters, most have been with our company for over seven (7) years and some as long as ten (10) years. Stetson Painting services combine reliability, quality of workmanship, and value for your money. We know there are many painting companies from which to choose; however, we are the premier painting company in Arizona. Stetson Painting is the premier painting company in Tucson and Phoenix because our employees are 1. highly trained; 2. maintain a professional appearance; 3. exhibit detailed oriented work product; 4. provide excellent communication skills; 5. take pride in our craftsmanship and 6. provide outstanding customer service. Stetson Painting has been an outstanding member of the Better Business Bureau (A+ accredited) and Registrar of Contractors since becoming a licensed contractor in 1994. We are also licensed, bonded, and fully insured with workers compensation, auto policy, and liability insurance. We will be glad to provide you a list of references to assure you of the pride we take in our work and our ability to satisfy our clients. Thank you for giving us the opportunity to introduce Stetson Painting to you. We appreciate your business and hope you will consider us for your project. If you have any questions, please feel free to give us a call. By listening to our customers and striving to surpass their expectations, Stetson Painting has learned to identify and prevent the problems and frustrations that clients often experience with other painting companies. This chart gives some examples of how we have adapted to outperform the competition and guarantee that our customers are delighted with our work. After the job is completed, some of your expectations have not been met. You end up paying more or remaining dissatisfied. Our office staff and project managers are proactive communicators. We listen to your needs and make sure you are happy before we leave a project. Stress is reduced and you get exactly what you wanted (or more), with no surprises. At the end of a job, there are unfinished items or extra charges that the contractor says were not included in the estimate. Our estimators provide thorough, detailed estimates. You know exactly what is included. There are no hidden costs or exclusions. Your new paint job does not last. Paint fails prematurely. We use superior materials with a 3-5 year warranty. All technicians are properly trained in surface preparation and paint application. Your new paint job will last longer. Your home is better protected against the elements, and the beauty endures. Long term, you save money because you repaint less often. Painters are unprofessional, unreliable, unskilled, or of questionable character. You don’t know who you are letting in your home. We retain long-term, quality employees. When we hire, we interview thoroughly and conduct drug and background checks. You have peace of mind with the assurance that every Stetson Painting employee who enters your home is trustworthy, skilled and professional. You struggle with color and design choices, but you want to be involved. Some contractors bully and push you, and others aren’t helpful at all. We offer color & design consultations by professionally trained decorative experts. Your home reflects your individual style and character, yet shows a professional designer’s touch. Your schedule is disrupted and your family inconvenienced by project delays. Our “On-time Scheduling Assurance” program guarantees we will start & finish your project on schedule. You don’t have to put your life on hold–you can make your plans and live your life without inconvenient scheduling headaches. Your home becomes a messy, untidy, unsightly, hazardous work site for the duration of the project. Your house becomes an obstacle course. Our “Clean Job Site System” includes a designated shop area where all supplies are kept neat and orderly. We also clean up each job site every day. Employees are always in uniform and do not smoke on the job site. Your home is kept clean, safe and orderly, with no hazardous tools or messy materials. No drywall-dust footprints or forgotten razorblades left behind. You are left unhappy because of uneven paint lines, sloppy or drippy paint application, and surface irregularities beneath the paint. We constantly adhere to our “Standards of Proper Preparation and Painting.” Painted surfaces are smooth and uniform, lines are tight and clean. All of your guests are impressed by the crisp, classy results. You can’t rely on your painting contractor; sometimes their results are great and other times they are poor. You don’t know what to expect. We train all of our applicators to consistently meet the high standards of the Painting & Decorating Contractors of America. Your paint job will reflect the high quality work you are expecting and your home will look spectacular throughout. Your paint job supposedly has a warranty, but when you try to claim it, the contractor can’t be found, or can’t financially back up its promise. We are a long-term, healthy company with a reputation spanning more than two decades. We will be here for our customers. You can be confident, knowing that if something goes wrong with your paint job, we will take care of it. Just call us, and we will address and resolve any issues fairly. You are exposed to financial risk and litigation because of uninsured or under-insured contractors. We maintain $1 million in liability insurance and a $1 million workers compensation policy. If any property damage, serious injury or accidental death occurred on your property, you are completely covered and have no liability.